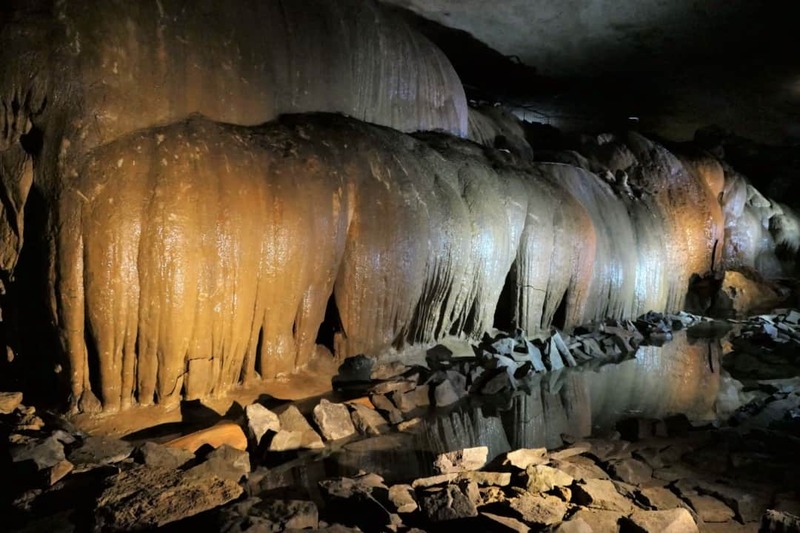 Cathedral Caverns, located in northeast Alabama, is a spectacular sight for the whole family. Now an Alabama state park, the cave has paved walking trails that are accessible to strollers and wheelchairs. It is a great first cave experience for the whole family. 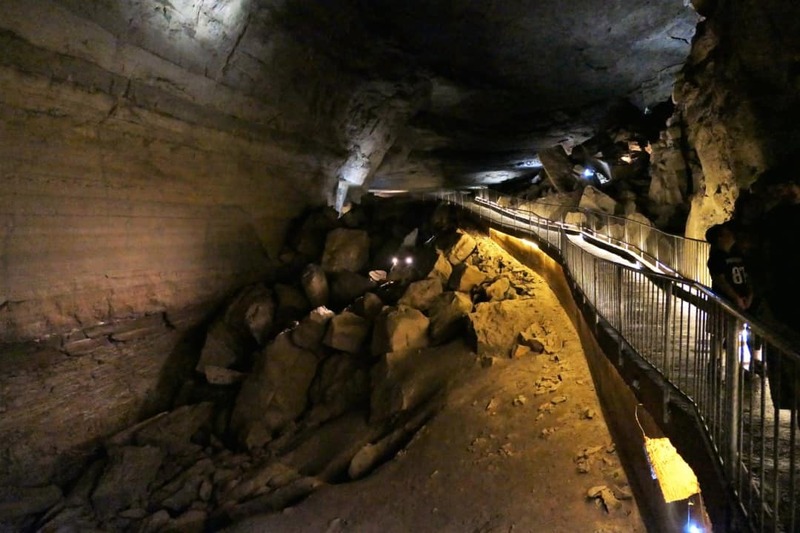 The caverns were originally occupied by native Americans. Archaeologists found pieces of pottery and arrowheads that date back approximately 9,000 years. It was rediscovered and explored by Jay Gurley. He sold everything he owned to buy the cave in 1952. He installed paths and lighting and opened it to the public in 1955. It was sold at auction to Tom German, who then sold it to the state of Alabama in 1987. 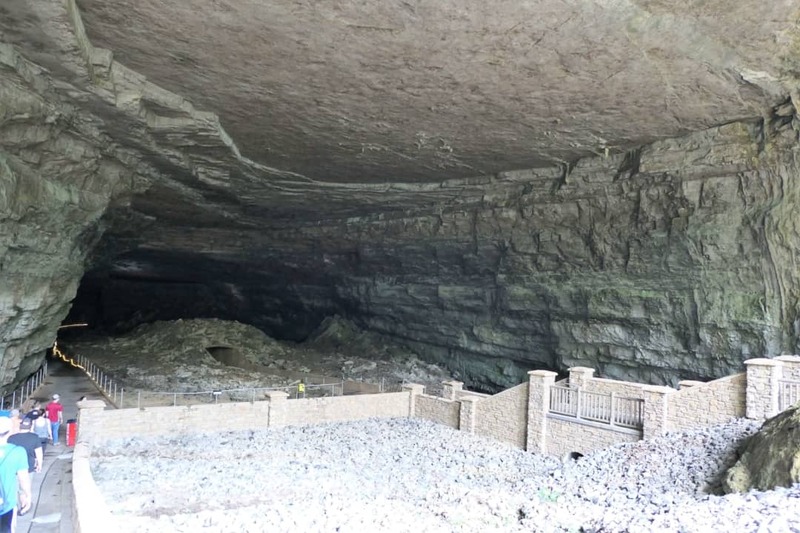 The state began exploring and restoring the cave in 1995 and it was opened to the public as Cathedral Caverns State Park in May of 2000. 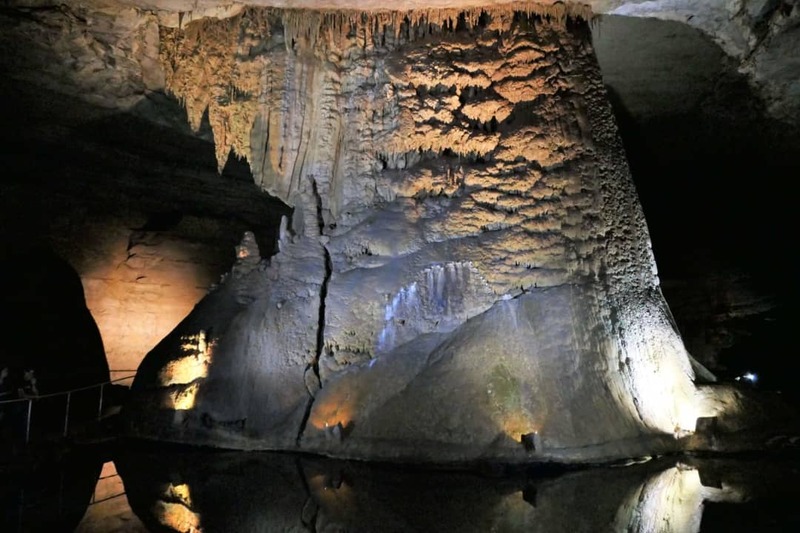 Cathedral Caverns State Park is located in Woodville, Alabama, just north of Guntersville Lake. Cell signal was spotty (T-mobile) so we used our car’s GPS. Once we got into the state park, the roads were well sign posted to find the parking lot for the cave. Tickets are available at the welcome center, which also has bathrooms, snacks, and souvenirs. There is a large porch with benches and rocking chairs to sit and wait for your tour time. Your guide will meet you on the porch. The gigantic entrance to the cave is 126 feet wide and 25 feet high. The tour starts on the path on the left side of the photo below. You can see the wide concrete walkway and it extends all the way through the caverns. The tour takes approximately 90 minutes and does followed paved concrete paths, which can easily be navigated by strollers and wheelchairs. Unlike a lot of caves, the rooms in Cathedral Caverns are all humongous. Several of them are larger than a football field. You will be traveling downward into the cave, so there are some areas that are sloped that you then climb up on the way back out of the cave. There were several families with strollers in our tour group and everyone was able to maneuver through the cave easily. The cave temperature stays around 60 degrees, year round, so you may want to bring a sweater. 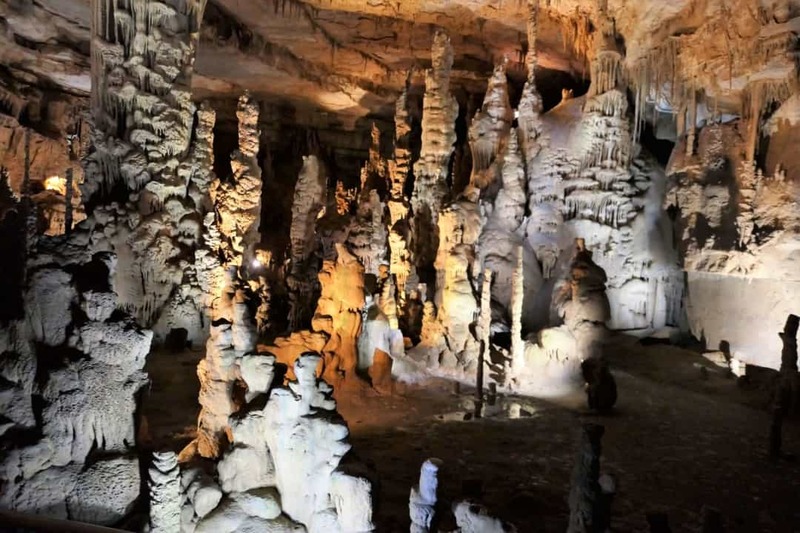 Cathedral Caverns is home to some of the most spectacular formations I have ever seen, including Goliath, which is 45 feet tall and 243 feet in circumference, making it one of the largest stalagmites in the world. There is a “frozen” waterfall that you can see from both the top and the bottom of the formation. The tour saves the best for last, as you get to see the area of the cave it was named for. The last room on the tour is a forest of stalagmites and stalactites that forms the Cathedral the cave is known for. Once the tour is complete, you can walk back along the same paths at your own pace to exit the cave. There are tables available for a picnic lunch as well as gemstone mining. You can also purchase a bag of mining dirt and and sift through it to reveal rough cut gemstones and fossils. There is a gemstone identification display near the water flumes.